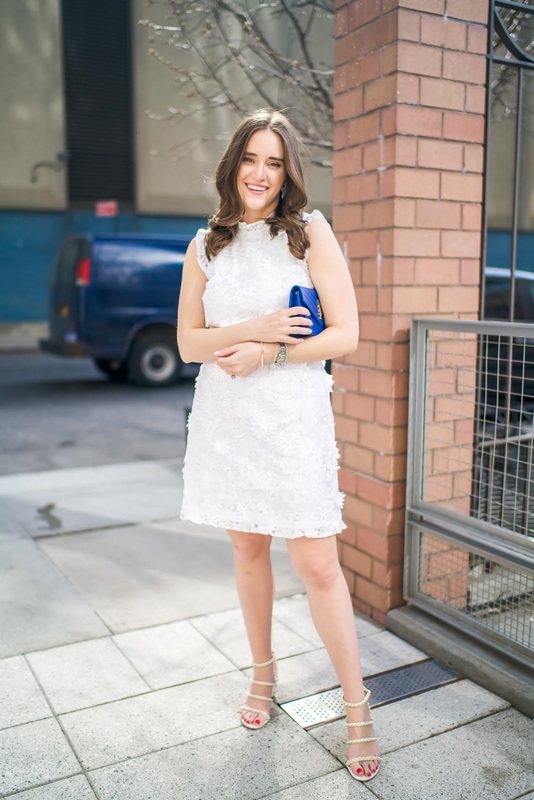 Are we or are we not all searching for white dresses for spring and summer? 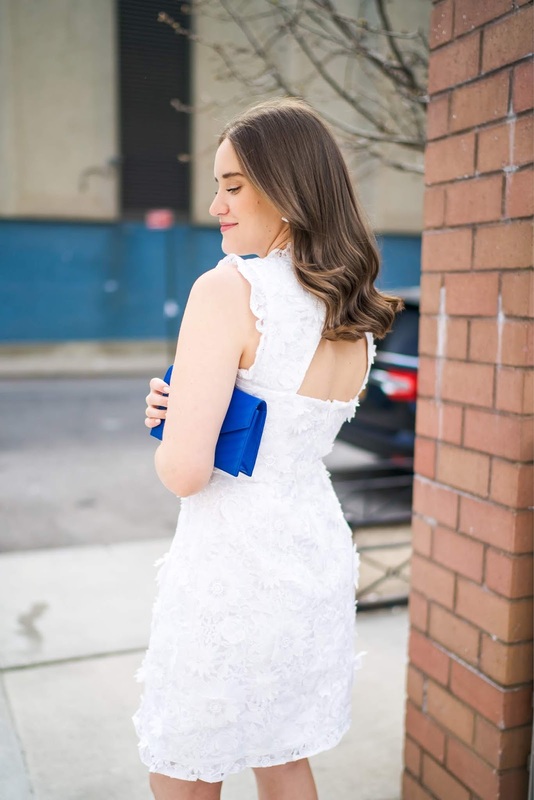 You don't have to be a bride to be to sport a cute white dress this year! I mean I've never lived by that rule and neither should you. So I'm trying to show off some of my great white dress finds as of late, starting with this dress. Nothing more traditional and classic than a nice a-line dress. To mix it up, the texture and appliqué of the dress makes it really fun, feminine and just the right about of different. It also comes in a few other colors for those who want to wear this to a wedding or a party. It's simple but not -- if that makes any sense lol. PLUS I love the back! You're able to wear a strapless bra with it or no bra since the fabric is thick enough. Which is nice since holes in the back usually mess up those options! In terms of sizing, this runs TTS and I ordered my normal size 6. And if you've been paying attention here you'll notice MY NEW SHOES. Ugh lol. The story behind these shoes goes back to the opening night of Hudson Yards. I was on my feet for 3 hours and in heels walking around so by the end of the night I couldn't even feel my feet. As I'm walking out of the building I spot these shoes in gold and I was like shoot. I have to have them. But I seriously could. not. walk. and definitely not able to try them on. So I snapped a picture and left the building, promising to return lol. So the next day (or maybe the one after that) I went back to the store and I was like let me see these in an 8. Which was the downfall of it all haha. I tried them on and LOVED them and then she told me they come in white and it was overrrr. Weirdly enough white isn't sold in stores -- only online! Then I convinced myself I didn't need them now and to wait until they go on sale to buy them (I totally get that they are too much for shoes). WHAT DO YOU KNOW they listened and went on sale for 25% off the next day. The rest is history and here we are. They're great. They run TTS and come in black, gold and white. They're not like the most comfortable shoes ever made (I'm extra sensitive because I don't wear heels so I'm really not used to it) but they aren't end of the world painful -- so they will be fine for my wedding festivities. I'm thinking of wearing them to the party over the weekend. It's going to be a lot of fun!! I'm also finding that I'm stocking up on wedding shoes and I wont have enough days to wear them all. Whoops!! That's a beautiful dress, all the detail in it makes it so special. 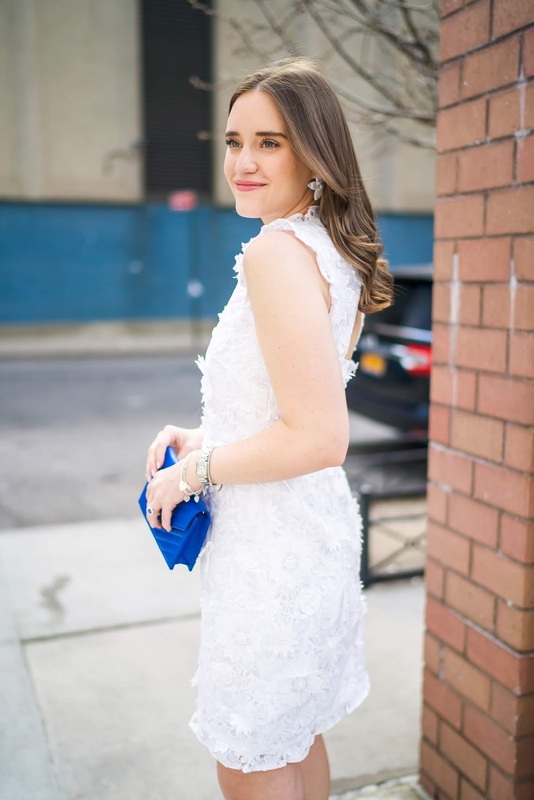 This look is gorgeous on you, Krista!! From your hair to the shoes and pops of blue, I love every part of it!